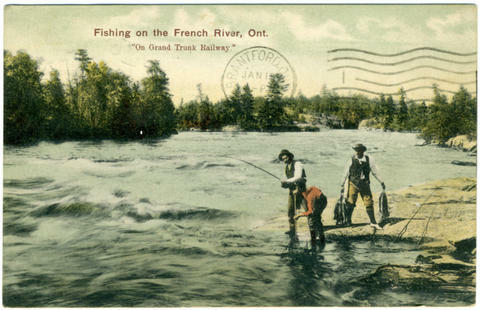 Item 034 - Fishing on the French River, Ont. "On Grand Trunk Railway"
Card is addressed to: Miss Ann Brick. Brantford. Ont. Mount Pleasant Road. Message reads: Bamberg, Jan 14, 1908. Dear Ann, Did you at last wake up? I was almost thuderstruck when your card came to hand. Now please write me a letter, you owe me one, I think. I enjoyed my Christmas holidays very well. With love, Afra.